DAAAAAAAAAAAMN SON! THIS IS JUST... DAMN!!! 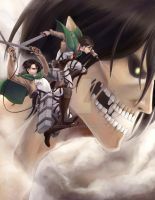 Is it posible to draw that awesome picture ???!!! I this available as a print?! I love this! Dj-Jo used this masterpiece for his cover of the Anime's first theme! The angle just makes this picture, WOW! Oh, I love it *O*. EPIC!! Congrats on the Daily Deviation! This piece totally deserves it! i bow in the presence of such greatness.